The average garage door should last between 15–30 years, depending on construction quality, maintenance and local climate conditions. Automatic garage door openers normally provide 10–15 years of reliable service. The more maintenance you carry out on the garage door the longer it should last. Using a professional garage door company for maintenance and repairs will likely mean you receive a higher level of service and this will prolong the life of your garage door. However, within your garage door’s lifespan you will probably encounter some common operational errors. Many of these can be avoided with regular maintenance. If and when you encounter these common errors, It is up to you whether you try and solve the problem yourself or if you call in a professional. There are advantages to calling out a garage door specialist now and again to assist your garage door maintenance including the fact they will be using specialist products, tools, and techniques. There also more complicated jobs which should always be left to the professionals such as installing a new garage door or fixing problems with the automation. Academy Garage Doors is a local garage door company who offer our services in High Wycombe, Witney, Reading, Maidenhead, and Oxford to name a few. If you live in the vicinity of these areas then chances are can offer you our expert services as well. Call us today on 01494 539 339 for more information and a free quote. In this article we will discuss a few of the most commonly encountered garage door problems and the best way to fix them, be it DIY or calling out a professional. One of the most common problems we get called regarding is that the operation of an automatic garage door has stopped working. Automated garage doors will more than likely have an option where you can opened them manually so if the automation breaks you will still have access to your garage. However, this is obviously inconvenient and it could cause security and personal injury risks. The first thing to do is turn the operator off and on again, and make sure you check the batteries in your remote. If you have replaced the batteries and the door is still not responding, then there may be a deeper problem, potentially with the electrics/motor, springs, or tracks. In this case, we recommend call out a garage door specialist, such as Academy Garage Doors to diagnose and fix the problem for you. We provide free no obligation quotes and our work is covered by warranty. Another operational issue that you may encounter with your automated garage door is that the sensors/autoreverse is not working. For your own safety we recommend testing the auto reverse function at least every 3 months. To test your sensors are working, place a piece of wood or a brick on the ground in the path of the door. When the door coming down touches that object, it should reverse direction and go back up again. To test the beam sensors close your door and pass an object underneath in the door’s path. Your door should reverse. If the expected result does not happen, it is important that you call your local garage door specialist and get the problem fixed as soon as possible as your garage door will be a safety risk. It’s inevitable that the springs used in your garage door will have to be replaced at some point. Much like the suspension system in your car, these springs will eventually wear out. 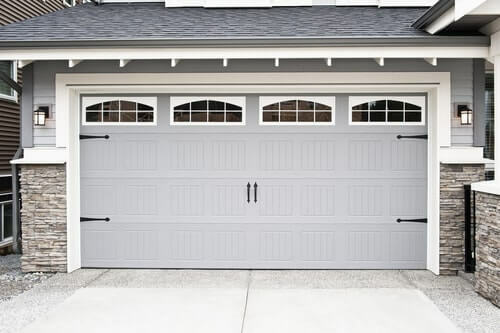 There are two kinds of garage door springs: Torsion springs – these run along the top of the door frame, and Extension springs – fitted at each side of the door frame. Both kinds of springs can lose tension over time or completely fail, which will make your door much heavier to lift and won’t provide the right support for the door when it’s lifted. Replacing the springs is relatively dangerous work that should not be undertaken by someone who isn’t familiar with your garage door system. They also have to be calibrated so that they are not too loose (which would cause the door to sag or even fall) or too tight (which could cause the door to open unexpectedly). A garage door specialist such as Academy Garage Doors, can adjust, repair or replace garage door springs. Older automatic doors opened and closed by swinging out and either up or down. Hinges allow the door to follow the track more closely to eliminate any need to swing. Rusty or broken hinges can hinder the door’s movement and should be oiled or replaced. The more regularly you lubricate the moving parts of you garage door, the longer these parts will last. A garage door company such as Academy Garage Doors can apply lubrication with a specialist lubricant. You should also contact a specialist if the hinges are past the point of saving. Replacing them is a technical job which requires specialist skills. Your garage door might start to feel stiff or unusually heavy. This could signal damage or interference on the tracks or rollers. The tracks direct the door precisely along the path it needs to travel. For that reason, the slightest deviation in the track can create serious problems for your door’s operation. Tracks can become clogged which will make the door tougher to open. Make sure the tracks are clean and free from any debris or obstruction. You can clean tracks easily with a cloth, but take care to avoid sharp edges while you’re cleaning. The track may become bent for a number of external reasons. For example, a person bumping into it with significant force could cause this to happen. If the track is out of alignment, the door may get stuck whilst operating. And if it’s bent far enough out of shape, the door could even jump track – which is dangerous. If your track requires realignment, the best thing to do is contact a professional. Trying to fix it on your own is difficult and potentially dangerous. Cracks are very common, especially for wood garage doors. To keep cracks from worsening, use a waterproof filler or sealant to caulk the cracks. Many garage doors come with weather sealants which keep water out, seals air leaks, and reduces street noise. If your sealant is broken, or you notice any cracks and seams, you may need to replace it. Remove the old weather sealant and install a new one. If you have noticed rust on your garage door then there are actions you should take before it is too late. Aside from tarnishing the look of your garage door, rust also compromises your door’s ability to lock out dirt and other external elements. Rust usually forms when iron gets exposed to air or water for a long period of time. To remove rust, clean the affected area with dishwashing soap first, then rub the rust with a cloth soaked in vinegar. Vinegar is a natural rust dissolver. You can avoid rust formation with annual maintenance work. Contact Academy Garage Doors today to book your garage door service. Regular maintenance minimises your chances of encountering any of the above problems. If you encounter a garage door fault and need help and assistance to get it fixed, call us today on 01494 539 339.